STUNNING open bayfront view from this clean-as-a-whistle updated 2-bedroom, 2-bath condominium residence. 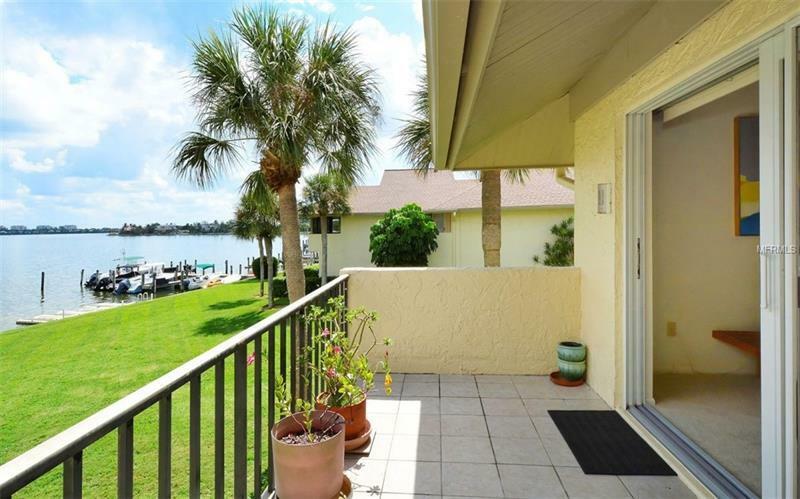 You will never tire of relaxing on the tiled balcony with preferred southeastern exposure, sipping a cool drink and watching the dolphins and boats in Sarasota Bay. On entering this light & bright furnished condo you are greeted by the BRAND NEW kitchen with white cabinetry, new quartz countertops, white subway tile backsplash & newer appliances. The master bathroom boasts new wood cabinetry and raised quartz countertop installed in 2018. Other improvements are impact sliding glass doors, upgraded new screened front door, air conditioning in 2016, water heater 2018, plantation shutters, and new carpet in 2017. Pelican Harbour is a beautifully landscaped gulf-to-bay community with deeded beach access, boat docks on deep sailboat water ($20 per foot per year), fishing pier, heated pool, 2 tennis courts, kayak/canoe storage & launch, separate storage lockers, and fully-funded reserves. It is pet-friendly allowing a large dog and on-site manager. Come and see this beautiful residence today! Copyright © 2019 Mid Florida MLS. All rights reserved. The data relating to real estate for sale on this web site comes in part from the Internet Data Exchange Program of Mid Florida MLS. Information provided is for consumer's personal, non-commercial use and may not be used for any purpose other than to identify prospective properties consumers may be interested in purchasing. Coldwell Banker participates in the MFRMLS Internet Data Exchange (IDX) program, allowing display of other MFRMLS broker's listings on this site. However may not include all listings currently available. Information is deemed reliable but not guaranteed. Information last updated at 2019-04-22 18:45:50.